1. What is your primary OT helmet make? 2. What is your primary OT armor make? 3. What is your FOTK helmet make? 4. What is your FOTK armor make? DA Props deserves a place on here - if we get enough support for him can we get him added please? Why is this so important to you, really? If it's TE derived (most likely) just tick that box and be done with it. No problem - I'm just keen to support my armour maker which I'm delighted with and it's a shame that he's not on the list. There are soo many vendors out there, not everyone can get their own slot. Especially if it's pretty much the same as any other vendor. Think of the options as different "families" of armour. CFO ROTJ has literally ZERO in common with FX or RS, therefore they each have their own slots. WTF, ATA and AP are all TE derived, but are in such high numbers that they warrant their own slots based on numbers alone. Fair point but there's so few UK armour makers I think it's unfair to leave out one of the longest standing and with so many troopers wearing them that can't vote for their armour? Few? UK probably has more TK armour makers than the US, and you have the top 3 makers on the list. As a middle ground, when a member selects “other”, is it possible for a “please specify” text box pop up for them to specify their armour maker? Once the poll is complete, a breakdown of “other” would then be available. But if this a poll to see what people are wearing in 2018 then why is it biased to only the approved list? 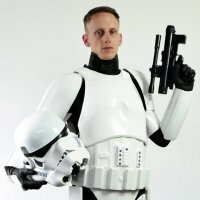 I find it odd that no-one has heard of Andy Rodgers or DA Props when so many troopers have one of more of his kits? I hope someone else will chime in to support him. It isn't. It is simply a top-of-the-head list of the most common makers. No worries - sorry I wasn't trying to cause offense, just passionate about trying to support my armour maker. People are very passionate about their armor. I’m passionate about MTK even though he is not a vetted source. And I may be in the US but I know about Andy. I was very close to purchasing his Tie kit because I thought it looked very nice. But shipping to the US made me go a different route. I wouldn’t hesitate to say that he has top quality stuff. I’ve never seen it in person but it appears that way and I have read people say they are very happy with the quality. I also think that him going by 3 names also hurts him because people don’t always see the correlation. But anyway like I mentioned, this is not a list designed to assist people in purchasing armor and to guide them in any way. The list was made to collect data on what types of armor people are wearing. Probably one of the reasons he is not on the list is that we don’t typically see build threads, EIB applications, or Centurion Applications for the armor. It doesn’t mean that there aren’t people wearing the armor out there and people don’t love it. But when it boils down I’m sure there are many more people wearing TM or RS which is why they are listed by name. i hope this helps. Just because something is not listed it doesn’t mean that people should not purchase it or it is not high quality. Guys - this is why we do these polls. When one of the "other" types of TE or non-TE derived armor gets a lot of votes, we dig through the data to find out if someone is big enough to fit in. Or, if they get only a few votes, we may take them off. If you want to support an armor maker, why not show off a build thread, or a troop thread, or have those with that armor apply for EI/Centurion? If it's that huge, then one would think they'd have shown up somewhere, no? Oh, and the "other" category is why we allow replies. Right now if only two people say they have DA props, then that tells us it's not that large. If 30 people come on this poll and say they sport his armor, then that is data we can use too. You know, that's a fantastic idea and would make great data. We can also take the time it was done and plot it out over time too. Let me see how much time I have today, though perhaps one of the DO's @Sly11 or @ukswrath may have it in their spreadsheet, or @Locitus can pull it faster than I can. If they don’t I do. Though I’m a bit out of date now, I’ve not updated since September. I voted and went ahead and voted for the FOTK variants I'm working on since the end is in sight. Hope that doesn't mess with your data. This is as at this morning for EIB and just now for Centurion. It includes people with multiple awards*, and all kinds inc TFA, TLJ etc. Bare this in mind for Anovos where it's not strictly OT but there's a few TFA/TLJs in there, often pulling double duty I am sure. Also remember this is all time data, which is why FX has such a strong showing. Also at 1.03% is MFX but below that everything less than 1%. * The current EIB number is 809 but thats 809 people with EIB. So people like Joseph, Tony and Glen only count once in the EIB number not many, many times each. Wow!! TM rocking the Centurions!! Great job Chris! It’s awesome seeing this data! Amazing! The data deserves its own thread. I imagine I am in the extreme minority with a kit like this but would still be interesting data.